Just discovered: Singapore Feng Shui practioner C.F. Wong and his assistant, main characters in The Feng Shui Detective by Nury Vittachi. Seems to have been printed around 2004. Whiskey and Water by Nina Wright, a mystery featuring a real estate agent Whiskey Mattimoe and her Afghan hound Abra, set on the shores of Lake Michigan. Next on the list, The Sudoku Puzzle Murders by Parnell Hall, a Puzzle Lady Mystery with crossword and sudoku puzzles sprinkled throughout the book for the reader to figure out. Solutions also included. I mean to also read The Moon in the Mango Tree by Pamela Binnings Ewen about a young singer in the 1920s whose husband is a medical missionary who becomes physician to the royal court of Siam. She travels around the world to find her place as a singer. The part about Siam intrigues me, especially the Siam of the early 1900s. I have also borrowed from the library, The Eye of Jade by Diane Wei Liang, a new detective series set in China, written by a Beijing-born woman who took part in the Student Democracy Movement in the 1980s in China, has a Ph.D in business administration from the U.S., and left teaching after 10 years to write for a living from London, where she now lives. More Chinese mystery novels! In the meantime, I also have to tend to the garden, where spring flowers have finished blooming and summer ones have not yet come up. The spirea bush needs trimming, and the mushroom mulch needs to be tucked around roots so that the roses and clematis start producing flowers again! Trying to use only organic type of fertilizers but will have to spray the rose bushes as they have some sort of brown spotting on the leaves. Can't wait till winter-spring to use what I learned in a three-hour tree pruning workshop I attended two weeks ago. (How much can you learn in 3 hours?) The Rose of Sharon and the red acer palmatum (Japanese maple) in the back as well as the green one in the front both need some shaping and controlling. Alas, I don't have the skill of Japanese gardeners, but will have to experiment. 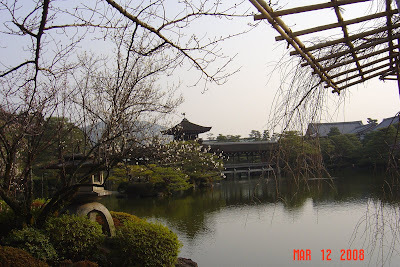 It was mid-March, just before spring, when I traveled for the first time to Kyoto, Japan. This Torii, a Shinto gateway, is flanked by evergreen trees. 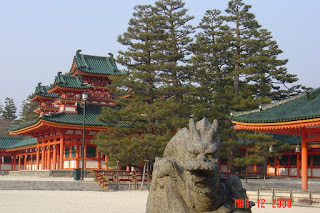 It is one of the largest in Japan. 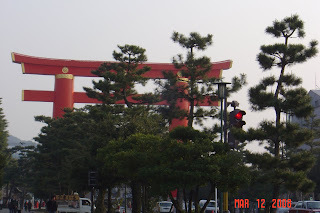 The Torii leads to the sprawling Shinto Heian-jingu Shrine. A stone lion stands guard in the forefront. Gardens surrounding the shrine are still under the spell of winter, with a promise of spring to come. A new novel by Fae Myenne Ng, American born Chinese, who writes about new Chinese immigrants and Chinese born Americans in California. Jack Moon Szeto is caught between the world of San Francisco and the world of old China, which follows him to this new country. Set in the 1960's, the novel deals with love and marriage, old traditions and the search for the new. 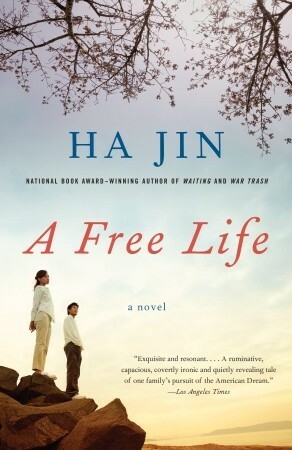 I am enjoying a very good book about a Chinese poet making a living as a chef in Georgia, by Ha Jin, A Free Life, which I am just about half way through. 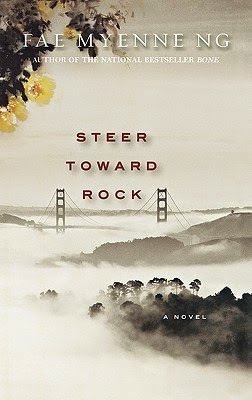 Next I'll start reading this new novel, Steer Toward Rock, published May 2008 by Hyperion. The immigrant experience once again, this time in San Francisco's China Town. My latest read - am about half-way through Ha Jin's A Free Life, a novel that describes the life of a Chinese student studying at Brandeis who is stranded in the U.S. after Tiananmen and who tries to make a life here with his wife and young son. A great book that helps us to understand the new immigrant experience.